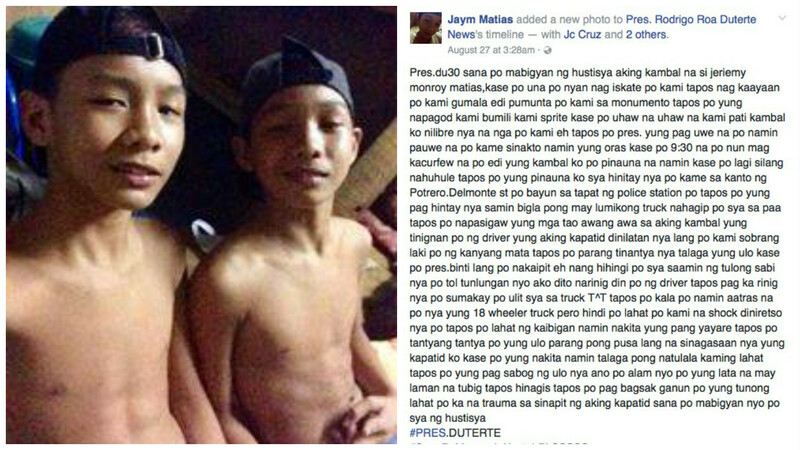 MANILA, Philippines - A 13-year-old boy from Malabon City is seeking the help of President Rodrigo Duterte after his twin brother was allegedly killed by a driver of an 18-wheeler truck on Tuesday, August 23. According to a Facebook post by a certain Jaym Matias, his twin brother Jeriemy Monroy was on his way home after skating in Monumento when he was hit on the leg by an 18-wheeler truck in front of a police station along Potrero-Del Monte Street. Because of the reckless move of the driver, Jereimy’s leg was badly injured from being stuck under the wheels. The truck driver went down his vehicle to check on Jereimy but to the witnesses’ horror, the driver immediately boarded the truck and intentionally drove over the poor teen’s body. Jaym, in his narration, said that the driver only stopped after his twin brother’s head was crushed. “Sumakay po ulit sya sa truck tapos po kala po namin aatras na po nya yung 18 wheeler truck pero hindi po lahat po kami na shock diniretso nya po tapos po lahat ng kaibigan namin nakita yung pang yayare tapos po tantyang tantya po yung ulo parang pong pusa lang na sinagasaan nya yung kapatid ko,” Jaym wrote in his post. A report by Definitely Filipino revealed that the truck driver was arrested by cops and had to be transferred to Malabon police headquarters since the victim’s family and friends were trying to attack him. In one of the comments on Jaym’s post, a certain Tj Dungca Santiago theorized that the driver intentionally killed Jereimy since his company would be paying for expenses brought about by the injury. Killing the victim, according to Santiago, would be much cheaper for the company since they would only pay for the funeral costs. “Batas daw nila yan. Kpag may nasagasaan sila tapos napilayan or what. Sagot ng kumpanya ang biktima hanggang sa gumaling or lifetime syang susuportahan kpag napuruhan. Kaya pinapatay na nila para pang libing na lang daw ang gastos ng kumpanya,” Santiago commented. As of this writing, Jaym’s post has gone viral amassing over 5,000 shares. Netizens are hopeful that Jaym would find justice for his twin brother’s untimely death.